More than 1.8 million college grads at the bachelor’s degree level are crossing the stage this year and entering the workforce. After all the late nights of studying, class projects, presentations and exams, they finally have that diploma in hand. As Millennials, they’re officially part of the most educated, mobile and in-demand generation of the workforce…who also wants it all. They’re seeking challenging careers, but more importantly, they want to be entrenched in the culture and progress of a city. While many graduates before them flocked to cities like New York, London and San Francisco after graduation, it’s becoming harder for Millennials to make their marks in these expensive and established locations. In fact, according to recent surveys, 46 percent of San Francisco Millennials are ready to move and more young people are moving out of London than at any time since records began. These migration shifts indicate that recent grads are, instead, choosing emerging cities that can satisfy their everyday needs and provide them better opportunities for success. Amsterdam, the capital city of the Netherlands, has a flourishing economy. As one of the most competitive business locations in Europe, companies across a multitude of industries like ICT, logistics, creative, life sciences, financial and business services, and fashion, call Amsterdam home. In return, creating a plethora of job opportunities and a low unemployment rate of 5.1 percent, both of which are appealing to recent grads. International graduates seeking employment can also take advantage of significant personal tax allowances and one of the lowest costs of living in Europe. The city is also known for its excellent work-life balance. In fact, according to OEDC, less than 0.5 percent of Netherlands employees report working more than 50 hours a week on average, compared to 11.7 percent of U.S. employees. The country of Portugal and the city of Lisbon, specifically, have come a long way since the country’s financial crisis in 2011. While over 485,000 citizens left the country, others saw it as an opportunity to revitalize through the arts and entrepreneurship. Six years later and Lisbon is prosperous. A 2016 study backed by Allianz Kulturstiftung, the German insurance company’s foundation, even ranked the city as the fifth-best-performing startup community in Europe, ahead of cities like Stockholm and Dublin. In Lisbon, recent grads can also enjoy affordable cost of living (12% lower than Barcelona and 48% lower than London) and an impressive culture full of the arts, local cafés and pubs and lively nightlife. The capital city of Santa Catarina in the Southern region of Brazil, Florianópolis is a young, lively place that offers expats and recent grads a unique and exciting place to work. With nearly 478,000 residents and strong information technology, startup, tourism and services industries, residents are able to experience both the benefits of urban and beach living. Florianópolis is known to be one of the safest cities in Brazil and also comes with the highest quality of life. Young professionals can enjoy restaurants, beaches, fitness activities and more, while still benefitting from a low cost of living. Rent prices alone are 43.5 percent lower than Rio de Janeiro. With an unemployment rate of 2.6 percent – one of the lowest in the entire U.S. – and an employed population growth of nearly 30 percent, the mile-high city is ideal for 2017 grads entering the job market. Denver is also home to many growing industries including technology and telecommunications as well as many Fortune 1000 companies including DaVita HealthCare Partners, Molson Coors Brewing and Chipotle Mexican Grill. What really sets Denver apart, however, is its quality of life. Millennials, who are more health conscious than other generations, can embrace Denver’s active lifestyle as it was named the No. 3 Fittest City in the U.S. in 2016 by the American Fitness Index. In the last two years, Atlanta has taken initiatives to dramatically grow its young professional and Millennial population through its careers, culture and community. And it’s succeeding. In 2016, the Bureau of Labor Statistics reported that while the U.S. workforce continued to grow at less than one percent, Atlanta grew by more than four percent with its booming health IT, FinTech, film, cybersecurity and mobile industries. In return, WalletHub ranked Atlanta as the No. 3 city for the most job opportunities heading into 2017. The city also offers recent grads with low cost, but high quality living with some of the U.S.’s top music, film and food scenes. New infrastructure, such as the Atlanta Beltline, is also connecting neighborhoods and making the city more walkable and bikeable. Lastly, with Southern hospitality engrained in its culture, Atlantans are willing to open doors, make introductions and share resources to help new grads succeed. For the class of 2017, it’s clear that opportunities are abundant. 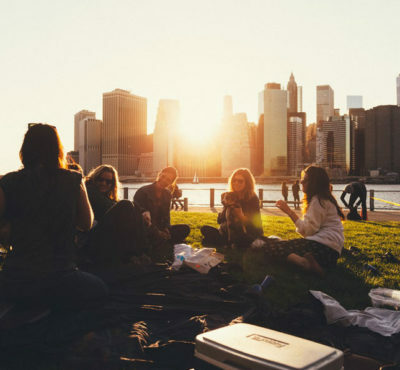 With global cities catering directly to Millennials, all that’s left for them is to choose. Kate Atwood is the executive director of ChooseATL, an initiative focused on telling a comprehensive story about the metro-Atlanta region in order to attract and retain top Millennial talent.